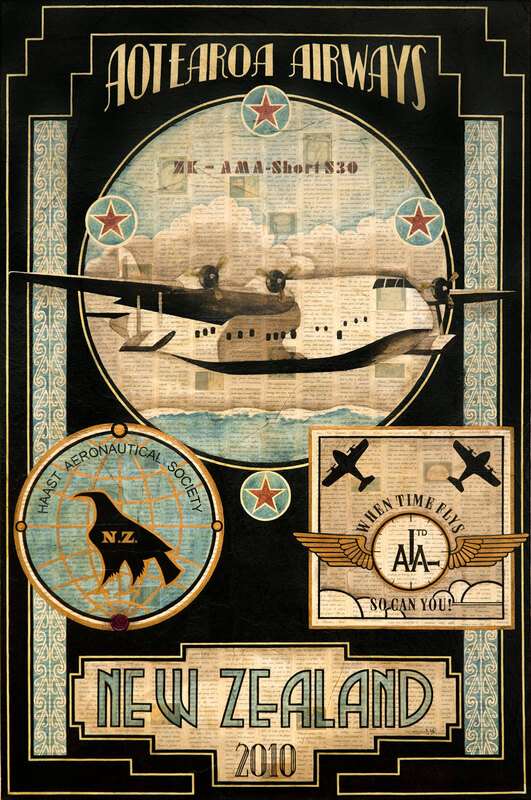 Air craft: Short S.30 Empire Class Flying Boat ZK-AMA Aotearoa. In April 1940, Air New Zealand was registered as a company in Wellington using the name Tasman Empire Airways Limited or TEAL. The aircraft that started it all was the ZK-AMA arriving in New Zealand in 1939. Aotearoa Airlines logo/wings: Inspired by the five ‘wings’ insignia of the New Zealand provincial airline main trunk operators. Kowhaiwhai (scroll design): The inspiration for this Kowhaiwhai came from two places. Ngaru, a traditional Maori design representing the cutting of the waves as the ‘waka’ moves through them. Part of the design was also inspired by the famous koru (fern frond) motif which Air New Zealand first applied to the tail of their aircraft with the arrival of the DC-10 in 1973. Haast Aeronautical Society: A logo I created introducing the Haast eagle to refer to the first largest flying ‘thing’ in the skies over New Zealand. I also wanted to reference the Royal Aeronautical Society in their dedication to the aerospace community.